As always, we’re wrapping up our look at a video card’s stock performance with a look at power, temperature, and noise. Like we discussed in the introduction, while the official TDP of the GTX 660 Ti is 150W – 20W lower than the GTX 670 – the power target difference is only 7W. So let’s see which is more accurate, and how that compares to AMD’s cards. Stopping to take a quick look at voltages, there aren’t any big surprises here. NVIDIA would need to maintain the same voltages as the GTX 670 because of the identical clocks and SMX count, and that’s exactly what has happened. In fact all single-GPU GK104 cards are topping out at 1.175v, NVIDIA’s defined limit for these cards. Even custom cards like the Gigabyte still only get to push 1.175v. Up next, before we jump into our graphs let’s take a look at the average core clockspeed during our benchmarks. Because of GPU boost the boost clock alone doesn’t give us the whole picture – particularly when also taking a look at factory overclocked cards – we’ve recorded the clockspeed of our video cards during each of our benchmarks when running them at 2560x1600 and computed the average clockspeed over the duration of the benchmark. Unfortunately we then deleted the results for the factory overclocked cards, so we only have the “reference” card. Sorry about that guys. The average clockspeeds on our “reference” GTX 660 Ti don’t end up fluctuating all that much. With a max boost of 1058 the card actually gets to run at its top bin in a few of our tests, and it isn’t too far off in the rest. The lowest is 1035 for Shogun 2, and that’s only an average difference of 22MHz. The GTX 670 on the other hand had a wider range; a boon in some games and a bane in others. If nothing else, it means that despite the identical base and boost clocks, our cards aren’t purely identical at all times thanks to the impact of GPU boost pulling back whenever we reach our power target. 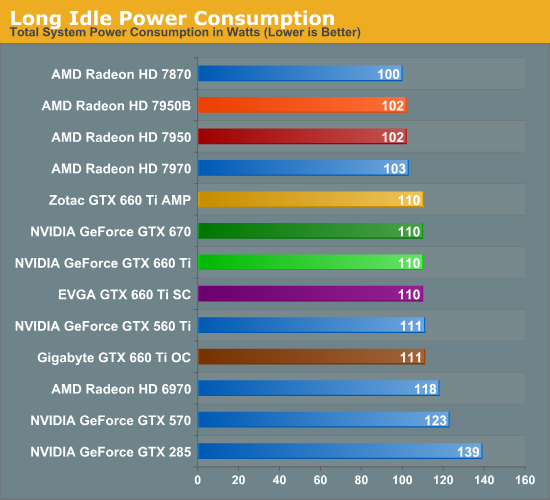 There are no great surprises with idle power consumption. Given the immense similarity between the GTX 670 and GTX 660 Ti, they end up drawing the same amount of power both during idle and long idle. This does leave AMD with an 8W-10W lead at the wall in this test though. Moving on to our load power tests we start with Metro: 2033. 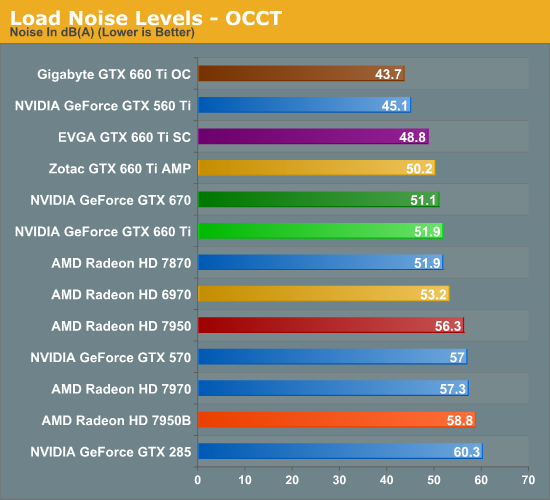 As we mentioned previously the GTX 660 Ti and GTX 670 have very similar power targets, and this benchmark confirms that. Power consumption for the GTX 660 Ti is virtually identical to the Radeon HD 7870, an interesting matchup given the fact that this is the first time NVIDIA has had to compete with Pitcairn. Pitcairn’s weaker compute performance means it starts off in a better position, but it looks like even with a salvaged GK104 NVIDIA can still compete with it. NVIDIA drove efficiency hard this generation; to compete with a smaller chip like that is certainly a testament to that efficiency. As for the inevitable 7950 comparison, it’s no contest. The GTX 670 was already doing well here and the GTX 660 Ti doesn’t change that. Tahiti just can’t match GK104’s gaming efficiency, which is why AMD has had to push performance over power with the new 7950B. Meanwhile it’s fascinating to see that the GTX 660 Ti has lower power consumption than the GTX 560 Ti, even though the latter has the advantage of lower CPU power consumption due to its much lower performance in Metro. Or better yet, just compare the GTX 660 Ti to the outgoing GTX 570. 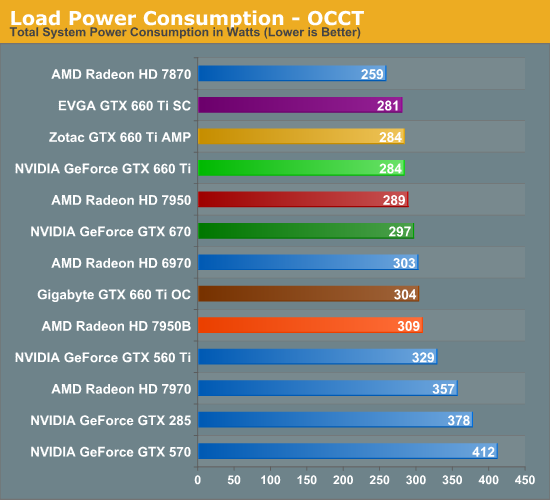 For AMD/NVIDIA comparisons we have a bit less faith in our OCCT results than we do our Metro results right now, as NVIDIA and AMD seem to clamp their power consumption differently. NVIDIA’s power consumption clamp through GPU Boost is far softer than AMD’s PowerTune. As a result the 7870 consumes 25W less than the GTX 660 Ti here, which even with AMD’s very conservative PowerTune rating seems like quite the gap. 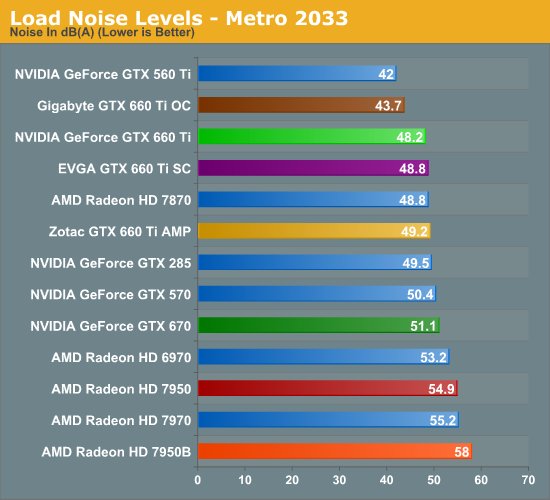 Metro seems to be much more applicable here, at least when you’re dealing with cards that have similar framerates. 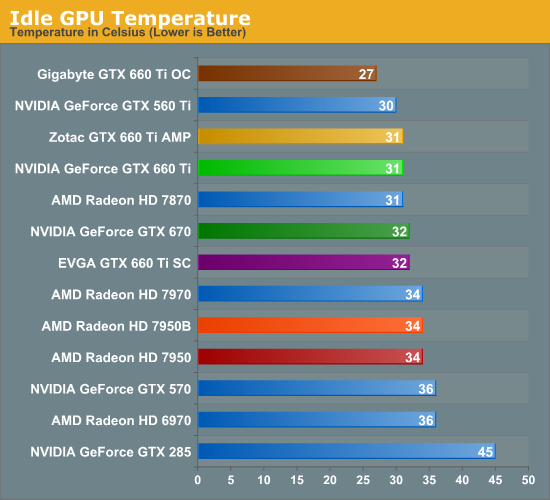 In any case, compared to NVIDIA’s lineup this is another good showing for the GTX 660 Ti. 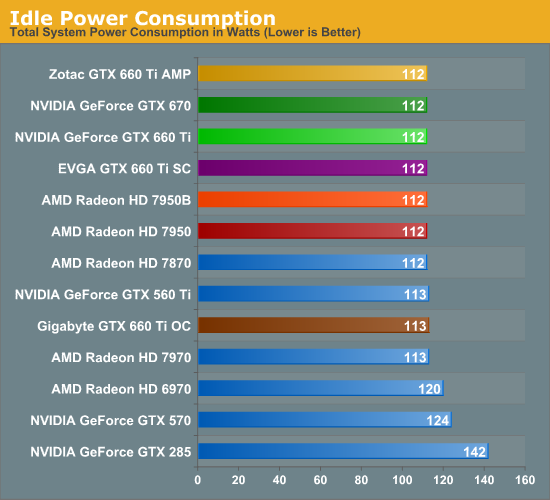 Power consumption at the wall is 45W below the GTX 560 Ti, a large difference thanks to the latter’s lack of power throttling technology. As for our factory overclocked cards, these results are consistent with our expectations. Among the Zotac and EVGA cards there’s a few watts of flutter at best, seeing as how they have the same power target of 134W. Meanwhile the Sapphire card with its higher power target is 20W greater at the wall, which indicates that our estimated power target of 141W for that card is a bit too low. However this also means that those times where the Gigabyte card was winning, it was also drawing around 20W more than its competition, which is a tradeoff in and of itself. Moving on to temperatures, at 31C the GTX 660 Ti is once more where we’d expect it to be given the similarities to the GTX 670. Open air coolers tend to do a bit better here than blowers though, so the fact that it’s only 1C cooler than the blower-type GTX 670 is likely a reflection on Zotac’s cooler. Speaking of factory overclocked video cards, one card stands out above the rest: the Gigabyte GTX 660 Ti. That oversized cooler does its job and does it well, keeping the GPU down to barely above room temperature. Considering that most of our high-end cards are blowers while our “reference” GTX 660 Ti is an open air cooler, temperature benchmarks are the GTX 660 Ti’s to win, and that’s precisely what’s going on. 67C is nice and cool too, which means that the open air coolers should fare well even in poorly ventilated cases. 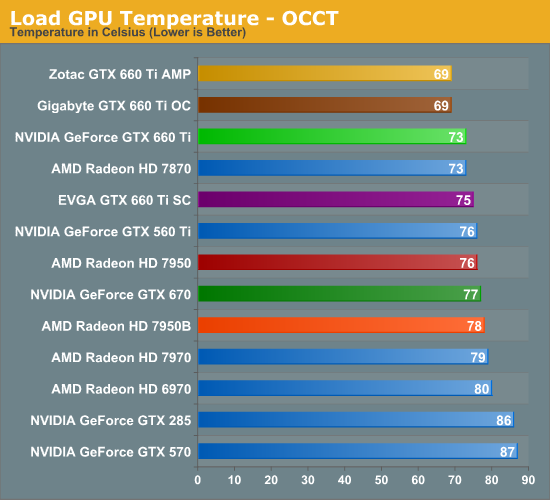 As usual we see a rise in temperatures when switching from Metro to OCCT, but at 73C the GTX 660 Ti is still the coolest reference (or semi-reference) card on the board. To be honest we had expected that it would beat the 7870, but as far as blowers go the 7870’s is quite good. Moving on to our factory overclocked cards, we’re seeing the usual divisions between open air coolers and blowers. The blower-based EVGA card performs almost identically to the GTX 670, which makes sense given the similarities between the cards. Meanwhile the open air Zotac and Gigabyte cards are neck-and-neck here, indicating that both cards are shooting for roughly the same temperatures, keeping themselves below 70C. Though it’s somewhat weird to see the factory overclocked Zotac card end up being cooler than its reference-clocked self; this appears to be a product of where the fan curve is being hit. Last but not least we have our look at noise, where we’ll hopefully be able to fully shake out our factory overclocked cards. Right off the bat we see the blower-based EVGA struggle, which was unexpected. It’s basically the same cooler as the GTX 670, so it should do better. Then again the EVGA GTX 670 SC had the same exact problem. 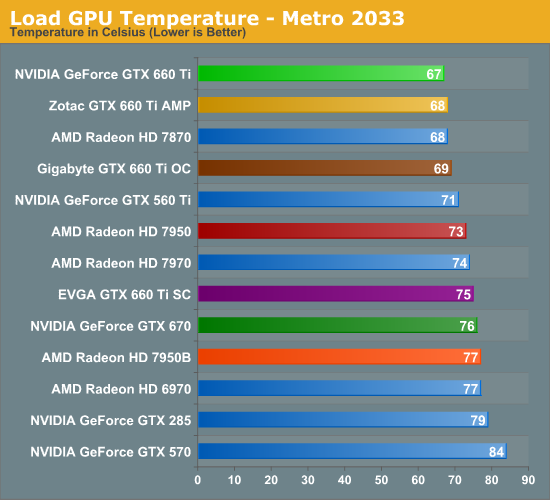 As for Metro, the GTX 660 Ti once again looks good. 48.2 isn’t the best for an open air cooler, but it’s a hair quieter than the 7870 and notably quieter than the GTX 670. 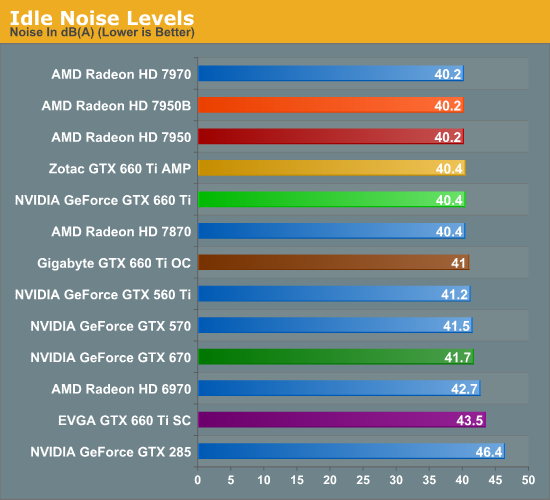 The only unfortunate part about these results is that it just can’t beat the GTX 560 Ti; in fact nothing can. For its power consumption the GTX 560 Ti was an almost unreal card, but it’s still a shame the GTX 660 Ti can’t be equally unreal. Moving on to our factory overclocked cards however, the Gigabyte GTX 660 Ti OC gets very close thanks to its very large cooler. 43.7dB technically isn’t silent, but it just as well should be. To offer the performance of a GTX 660 Ti (and then some) in such a package is quite the accomplishment. As for Zotac and EVGA, there’s nothing bad about either of them but there’s also nothing great. EVGA’s card is about average for a blower, while Zotac’s card seems to be suffering from its size. It’s a relatively tiny card with a relatively tiny cooler, and this has it working harder to hit its temperature targets. Finally we have noise testing with OCCT. Our “reference” GTX 660 Ti actually fares a bit worse than the GTX 670, which is unfortunate. So much of this test comes down to the cooler though that it’s almost impossible to predict how other cards will perform. At least it’s no worse than the 7870. Meanwhile the Gigabyte GTX 660 Ti OC continues to impress. 43.7dB not only means that it didn’t get any louder switching from Metro to OCCT, but it has now bested the GTX 560 Ti thanks to the 560’s lack of power throttling technology. Make no mistake, 43.7dB for this kind of performance is very, very impressive. As for EVGA and Zotac, it’s also a rehash of Metro. EVGA’s blower is actually over 1dB quieter than Zotac’s cooler, which is an unfortunate outcome for an open air cooler. Wrapping things up, even without a true reference sample from NVIDIA it’s clear that the GTX 660 Ti has a lot of potential when it comes to power/temp/noise. 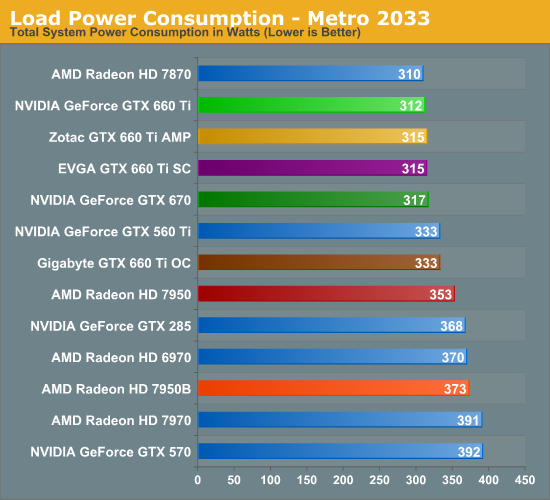 Compared to other cards it’s roughly equivalent in power consumption and noise to the 7870, which for NVIDIA is an important distinction since it’s also notably faster than the 7870, so NVIDIA is on a better place on the power/performance curve. This goes for not only the 7870, but especially the 7950, where the GTX 660 Ti continues the tradition the GTX 670 already set, which will see the GTX 660 Ti being cooler, quieter, and less power hungry than AMD’s entry-level Tahiti part. But it must be pointed out that the lack of a reference design for the GTX 660 Ti means buyers are also facing a lot of variability. Power consumption should be consistent between cards – which is to say a hair less than the GTX 670 – but temperature and especially noise will vary on a card by card basis. Potential buyers would best be served by checking out reviews ahead of time to separate the duds from the gems. Well it depends on the samples, the 660 ti I bought for my wife, I tested it in my pc and over 1290 core clock(with boost) after 10-15 minutes gaming in a game that doesn't even taxes the gpu past 70%, the video card crashes and windows tells me ''the adapter has stopped responding''. Crysis 2 stutters on some levels but it's mainly stable 95% of the time wheras my 7950 overclocked is not doing this. TXAA - AWESOME - THE JAGGIES ARE GONE. Thank you nVidia for being able to mix ram chip sizes or to distribute ram chips across your memory controllers with proprietary technology that you keep secret depsite amd fanboys desiring to know how you do it so they can help amd implement for free. Thanks also for doing it so well, even with reviewers putting it down and claiming it can result in 48 bandwidth instead of 144 bandwidth, all the games and tests they have ever thrown at it in a desperate amd fanboy desire to find a chink in it's armor has yielded ABSOLUTELY NOTHING, as in, YOU'VE DONE IT PERFECTLY AGAIN nVidia. I just love the massive bias at this site. It must be their darn memory failing. Every time they make a crazy speculative attack here on nVidia where all their rabid research to find some fault provides a big fat goose egg, they try to do it again anyway, and they talk like they'll eventually find something even though they never do. By the time they give up, they're off on some other notional and failed to prove it put down against nVidia. ROFL... I should have just read more posts...Might have saved me a crapload of typing Cerise...LOL. Nah, it needs to be said more by more than ONE person :) Call a spade a spade people. But hold on a minute, while I fire up my compute crap (or 2008 game rendered moot by it's own 2011+2012 hires patch equivalent) so I can run up my electric bill so I can prove the AMD card wins in something I never intend to use a gaming card for or run at a res that these things aren't being used for by 98% of the people. Folding? You must be kidding. Bitcoin hunting?...LOL that party was over ages ago - you won't pay for your card getting bitcoins today - it was over before anandtech did their article on bitcoins - but I bet they helped sell some AMD cards. Quadro+fireGL cards are for this crap (computational NON game stuff I mean). Recommending cards based on computational crap is pointless when they're for gaming. I'm an amd fanboy but ONLY at heart. My wallet wins all arguments regardless of my love for AMD (or my NV stock...LOL). I'm trying to hold out for AMD's next cpu's but I'm heavily leaning Ivy K for Black Friday, fanboy AMD love or not. They ruined their company by paying 3x the price for ATI, which in turn crapped on their stock and degraded their company to near junk bond status in said stock (damn them, I used to be able to ride the rollercoaster and make money on AMD!). I'm still hoping for a trick up their sleeve nobody knows about. But I think they're just holding back cpu's to clear shelves, nothing special in the new ones coming. Basically a sandy to ivy upgrade but on AMD's side for bullsnozer. The problem is it's still going to be behind ivy by 25-50% (in some cases far worse). Unless it's an EXCEPTIONAL price I can't help but pick IVY as I do a lot of rar/par stuff and of course gaming. I'd get hurt way too much by following my heart this round (I had to take xeon e3110 s775 last time for the same reason). My planned Black Friday upgrade looks like, X motherboard (too early for a pick or homework not knowing AMD yet), Ivy 3770K (likely) and a 660TI with the highest default clock I can get at a black friday price :) (meaning $299 or under for zotac AMP speeds or better). I already have 16GB ddr3 waiting here...LOL. I ordered it ages ago, figuring it's going to go through the roof at some point (win8? crappy as it is IMHO). I'm only down $10 so far after purchasing mem I think in Jan or so...LOL. In the end I think I'll be up $30-80 at some point (I only paid $75 for 16GB). Got my dad taken care of too, we're both just waiting on black friday and all this 28nm vid card crap to sort out. End of Nov should have some better tsmc cards available (or another fabs chips?). I'm guessing a ton at high clocks by then for under $299. Review was a good read, glad to see the 660 TI is doing well. I have no idea what's up with the comments though, especially you TheJian, you wrote a novel, ending half the paragraphs with "... LOL". 1) TXAA is a blurry mess. See videos or screenshots. It's an option but let's not try claiming it's some new revolutionary anti-aliasing features. Instead HD7950 can actually handle MSAA and mods in Skyrim and Batman AC and not choke. (I) Factory preoverclocked, binned after-market 7950s run cooler, quieter and at way lower voltage than that reference artificially overvolted 7950B card tested in the review (see MSI TwinFrozr 3, Gigabyte Windforce 3x for $320-330 on Newegg). (II) Those same after-market 7950s hit 1100-1200mhz on 1.175V or less in our forum. At those speeds, the HD7950 > GTX680/HD7970 Ghz Edition. How is that for value at $320-330? The review didn't take into account that you can get way better 7950 cards and they overclock 30-50%, and yet the same review took after-market 660Tis and used their coolers for noise testing and overclocking sections against a reference based 7950.